Sheriff Joe Arpaio may agree with "95 percent" of President Donald Trump's policies, but he has his own plan for the Dreamers. "I would deport these Dreamers and let them see the country they came from, be ambassadors to our country, and later on give them kind of a fast track to come back into the United States legally and that would take care of a lot of issues," he told ABC News, talking about recipients of the Deferred Action on Childhood Arrivals. "A lot of these Dreamers have a good education and all that and they can go into [their home] country and be ambassadors and talk how great America is and also see their country. And maybe some of them don’t want to come back -- who knows, if they get a big job -- but if they want to come back, let them come back like everybody else, and let them come into our country and do what everybody else does that comes into our country, with a green card," he said. Arpaio, who is running for the Senate seat that will be vacated by Sen. Jeff Flake in Arizona, said that he's "always been against amnesty" but he isn't going to write off the White House's immigration plan immediately, even though it leaves open the possibility of giving DACA recipients a path to citizenship. "I don't know all the facts about what the president said but, you know, he does change his mind so until I see everything in writing I'm not going to get into it," Arpaio said. Arpaio said that he hasn't written the plan up, saying he "came up with this on a couple broadcasts" based on his experience serving internationally in Argentina, Mexico and Turkey during his time at the Drug Enforcement Agency before returning to Arizona. In this Jan. 26, 2016, file photo, then-Republican presidential candidate Donald Trump is joined by Joe Arpaio at a campaign event in Marshalltown, Iowa. Arpaio, a controversial, longtime sheriff who was subject to multiple federal investigations relating to discriminatory conduct, and Ward are two of at least seven Republicans who will be battling it out in the primary, vying for the Senate spot that will be vacated by Flake's decision not to run for re-election. The inter-party fighting has already started, too, as The Arizona Republic reported Thursday that they obtained a draft of a resolution that may come up at this weekend's state party convention which praises Arpaio and then calls for him to drop out of the race. 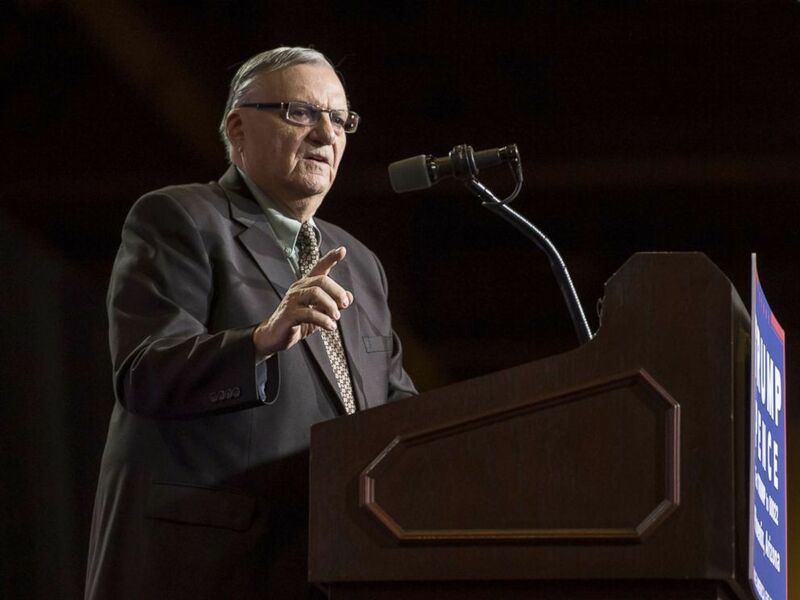 "I don't know why they're trying to get me out with all my background," Arpaio told ABC News. "It's all politics. It doesn’t bother me at all," he said. Maricopa County Sheriff Joe Arpaio speaks during a campaign event for Donald Trump, 2016 Republican presidential nominee, in Phoenix, Arizona, U.S., Aug. 31, 2016. There's likely going to be a fight for Trump's endorsement ahead for the Republican field as well. Trump posted a supportive tweet about Ward back in August, but Arpaio's ties to Trump extend well beyond that. 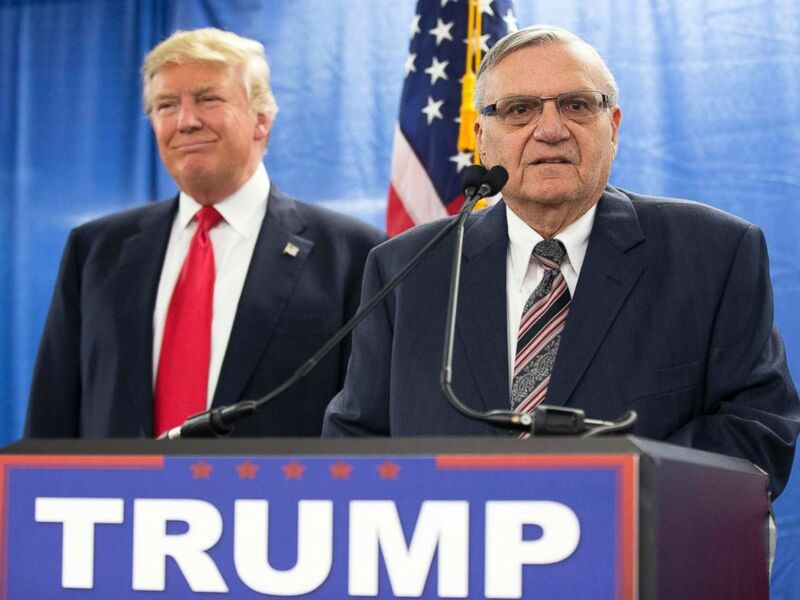 Arpaio endorsed Trump in January 2016, and Trump granted Arpaio a controversial pardon in August 2017. Arpaio was found guilty in July 2017 on criminal contempt charges stemming from his refusal to stop imprisoning suspected illegal immigrants. Arpaio, 85, told ABC News that he "never talked to him about the pardon." "He just did the right thing. He knew I'm not guilty," Arpaio said. In this Jan. 26, 2016 file photo, Republican presidential candidate Donald Trump, left, is joined by Maricopa County, Ariz., Sheriff Joe Arpaio during a new conference in Marshalltown, Iowa. When asked if he would be seeking Trump's endorsement in the Senate race, Arpaio said he doesn't plan on asking for it. "I'm not asking him for any endorsements but if he does I really would honor that because, as I said, he knows my background but I'm not going around asking about it. 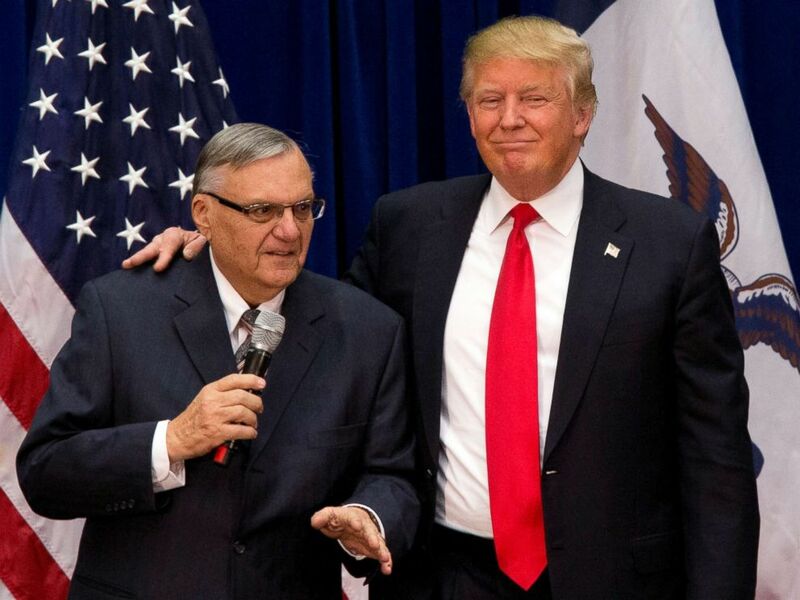 I was with him from Day One," Arpaio said. He even went on to call Trump his "hero." "I probably agree with him about 95 percent of what he says," Arpaio said, adding that "I don't even know what the [remaining] 5 percent is really." 18 For 18’ is ABC News’ powerhouse political coverage of the 2018 midterm elections. Coverage kicks off Sunday on “This Week with George Stephanopoulos,” featuring a report on the 2018 midterms and the special House of Representatives election taking place next month in Pennsylvania. Coverage continues on “Nightline” on Monday. To stay up to date, visit ABCNews.com and the ABC News app, and follow our midterm elections alerts.